"No child should be subjected to torture, inhuman or degrading treatment or punishment"
Israel has occupied Palestine since 1947 and three generations have grown up only knowing a life governed by the Military Rule administered by a foreign army: the Israeli Defence Force and by the military courts. A systemic targetting and victimisation of the younger generation mainly towards young men has developed. This is not a wild exaggeration; it is borne out by the fact that, up to April 2013, 1,518 children have been killed by the army since September 2000, one every 3 days. Their victimisation has been documented by ex- Israeli soldiers who formed a group called Breaking the Silence. 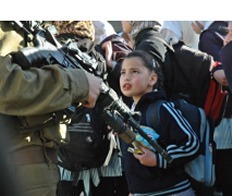 Moreover Israel is the only country in the world that prosecutes children in a military court. Coupled with this, the occupied Palestinian territories have been prevented from developing their economy by Israel so the youth under 19 who make up 60% of the population suffer from lack of jobs. The impact of this permeates all of the West Bank but particularly for those living in Hebron, the refugee camps or towns and villages near settlements or the Apartheid Wall. Statistics and reports have been compiled by Defence of the Child International Palestine and other human rights organisations. These have found that every year around 700 Palestinian children between 12 and 17 are arrested, mainly boys and for stone throwing. Children below the age of 12 are sometimes arrested and 179 are currently in prison. The purpose of the whole arrest process is to degrade and dehumanise the children. Many are arrested in the middle of the night, their homes are trashed and the parents are not informed about the reason or where they are being taken. Many are subject to being beating, interrogation without a lawyer or parent present, general abuse for being Palestinian and sexual threats. During transfer to an interrogation centre they can suffer ill treament - verbal or physical abuse, lying on the floor of the jeep, denied water and toilet facilities. During interrogation there is no lawyer or parent present. Confessions are coerced, they are frequently held in stress positions, sometimes with electric shocks or held in solitary confinement They are brought to court, usually after a long period since their arrest, shackled and in leg irons; a lawyer being present for the first time. The only evidence is the 'confession'. Maximum imprisonment for throwing stone at a person or property is 20 years. 100% Use of Hand Ties, 90% use of Blindfolds, 70% Beaten or kicked, 60% Position abuse, 55% Threats or inducements, 50% Confession during interrogation, 45% Verbal abuse or humiliation, 27.5% Shown documents in Hebrew, 22.5% Detained with adults 22.5%, 17.5% Solitary confinement, 17.5% Strip search, 7.5% Electric shocks, 7.5% Threat of death or sexual assault. More recently, in 2013, the DCI-Palestine reported three in four Palestinian children detained in 2013 by the Israeli military in the occupied West Bank endured physical violence during arrest and interrogation. Also, since mid-2013, it has been concerned over increasing violence by Israeli soldiers against Palestinian children living in refugee camps located in the occupied West Bank and an 18.8% increase of prosecutions from December 2013 to January 2014, including 20 children of the ages between 14 and 15. All this is of course a violation of International Law: the Geneva Convention 1949 and subsequent protocols; the UN Convention against Torture, Cruel, Inhuman or Degrading Treatment or Punishment, 1989 (Ratified by Israel in 1991) the Convention of the Rights of the Child 1984 (Ratified by Israel in 1991) and regular reports are made to the UN Security Council Working Group on Children and Armed Conflict. Jean Gough, a UNICEF representative for the West Bank and Gaza said "As stated in the Convention on the Rights of the Child, the detention of children should be used only as a measure of last resort and for the shortest appropriate period of time." 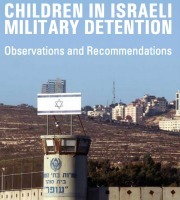 Under pressure from human rights groups a Parliamentary cross party report was conducted and published in 2012 with the FCO, Children in Military Custody, but things have worsened in 2013 and, although Israel made a few cosmetic changes in theory, evidence shows that these were not implemented on the ground. Israel remains unaccountable and resolute in its systemic abuse of children's rights which are also racist as Israeli children are under the jurisdiction of civil law. UK lawyers are currently visiting the West Bank to see for themselves and will report back soon.